Welcome back, Tar Heels! We hope you have a great year. Senior public relations major Cassie Hazell, who works in the Library Communications Office, reviews a few things we did over the summer to make the University Libraries even better. If you’ve ever wondered if your podcast could become the next “Serial” or “This American Life,” the new studio in the MRC has everything you need to get started on creating a podcast of your own. Just make sure you bring your own laptop so you have somewhere to save your audio and also check out this video to learn how all the equipment works. Wilson Library may make you think of Hogwarts, but you don’t need magic powers to find your way around. If your professor sends you to look at a rare book, or if you want to see some of Carolina’s founding documents, we’ve made it easy to find your way around. Visit the new single service point in the special collections research room on the main floor. We’ll get you started, wherever your research may take you. Infrastructure work is underway in Davis Library and we’ll be honest, it’s a bit of a mess. Part of the first floor is behind plywood right now, plus floors three and four will be closed for part of the fall. The good news is that if you need a book from a closed floor, the Carolina BLU delivery service will retrieve it for you and have it waiting at the Service Desk. The other good news is that we’ve made improvements elsewhere in Davis Library. There are now glass whiteboards in every group study room in Davis for drawing diagrams or playing a game of hangman during a study break. Reserve a room online, then access with your One Card. You can even check out markers and erasers at the Service Desk on the first floor. On the eighth floor of Davis Library, you’ll find brand-new furniture for those long nights when you stay up until 2 a.m. studying for your Econ 101 exam because you can’t understand math to save your life. (I ended up with a B, in case anyone was curious). Pre-meds already know that the Health Sciences Library (HSL) is pretty awesome. 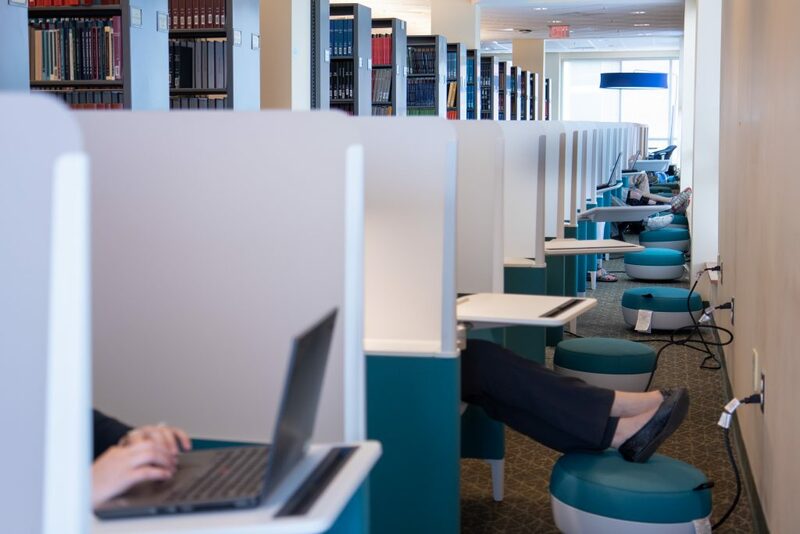 Take a walk to South campus and discover the comfortable new furniture on floor four that will help you engage in calm, uninterrupted study or collaborate with classmates. The new furniture includes foot rests, charging stations, storage spaces and, most importantly, comfy chairs, making napping in a public place even easier. Story by Cassie Hazell. Cassie is a member of the class of 2019, majoring in public relations.